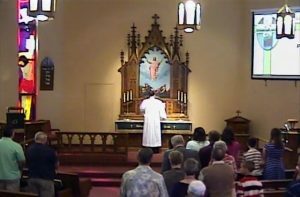 Regular worship services are held every Sunday at 10:00 a.m. for people of all ages. During the summer months they are held at 9:00 a.m. Special midweek worship services are held during Lent and Advent on Wednesdays at 7:00 p.m. This time also applies to evening services for Thanksgiving Eve, Good Friday, and Ascension. There are also services at 6:00 p.m. on Christmas Eve and 10:00 a.m. on Christmas Day. The Sacrament of the Lord’s Supper is offered on the first Sunday of each month and at our special services on Ash Wednesday and Good Friday evening. Grace Lutheran School is a Christian elementary schooled dicated to educating our children in light of God’s Word both for this life and for the life to come. We offer a Christian education from Kindergarten through eighth grade. Additional educational opportunities are available at Immanuel Lutheran, our affiliated high school, college, and seminary located in Eau Claire, Wisconsin. Sunday School is available at 9:00 a.m. every Sunday except for summer months for children ages four through eighth grade. Bible stories are taught with the goal that our children grow in faith in their Savior Jesus Christ. Bible Class is held every Sunday at 9:00 a.m. except for summer months. Young people and adults study books of the Bible and various issues dealing with their spiritual lives. VBS is held for one week during the summer for children ages four through eighth grade. Different Bible stories are taught related to a central theme dealing with our Christian faith and life. Audio tapes, CD’s, video tapes, and DVD’s are available of our church services held at Grace. They are also broadcast over Grace’s web site. Additional educational materials are available through our Pastor. Pastoral consultation is available for troubled, confused, or questioning souls. Such counseling is based solely upon the Scriptures where God has specific spiritual prescriptions and guidance for all people. Information classes are held with individuals who want to know more about our Savior and His Word, and are considering membership at Grace Lutheran Church.